With most every craniofacial surgery a new appearance emerges. It may take time to adjust to the changes. It may take parents a long time. 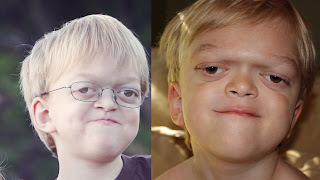 We have only been through two craniofacial surgeries, and the first nearly broke my heart. I loved my little guy's big eyes and metopic ridge, he was my baby and I had no doubt he was the most beautiful child in the world. I cried, a lot, about the loss of that precious face. Following the recovery of John's anterior cranial vault, he looked angry to me, with the brow bone pulled forward. Luckily after a few months, I didn't think about it any longer, unless I was looking through old photos. Still that tinge of pain pulled at my heart, he had been perfect as he was. I soon came to realize, or rather remind myself, that he was perfect with his new look too. I was anxious about this aspect with our most recent surgery. I knew our doctor was planning to over correct to a higher degree this time, to prevent another incident with John's eye. His right, more proptotic eye had dislocated a few days after Christmas. It was a scary experience, and we definitely do not want that to happen again. Anyway, I just knew I was going to have a hard time with these changes, as I had the first go round. When we first saw John in the PICU, just out of surgery, I was shocked at how calm I was. That feeling I had experienced back in 2008, a little dizzy, and very sad, didn't hit me. Still, I knew it was coming, I was bracing myself. But lo and behold, I have yet to feel a sense of loss with this one. Maybe I have come to a new place of acceptance. Maybe John's personality is bigger and more defined this time, and has helped to compensate for the changes in his appearance. Maybe my emotions have hardened over this journey, and I must note, I was 7 months pregnant last time. I have no real explanation for it, but it has been so much easier on me this time. This is what I want, isn't it? I want everyone to know my son on a level much deeper than his outward appearance. And I especially want others to "judge" him by the content of his character, not by the placement of his brow bone or jaw alignment. Perhaps me not placing a whole lot of focus on his looks is a step in the right direction. Of course, that statement is hardly accurate at face value. I do care, I want him to be happy with how he looks, I want him to feel confident. We discuss these things with his doctors every single appointment. How can we achieve the most "normal" appearance? I suppose there is a balance that we must find in dealing with this aspect of a craniofacial condition. 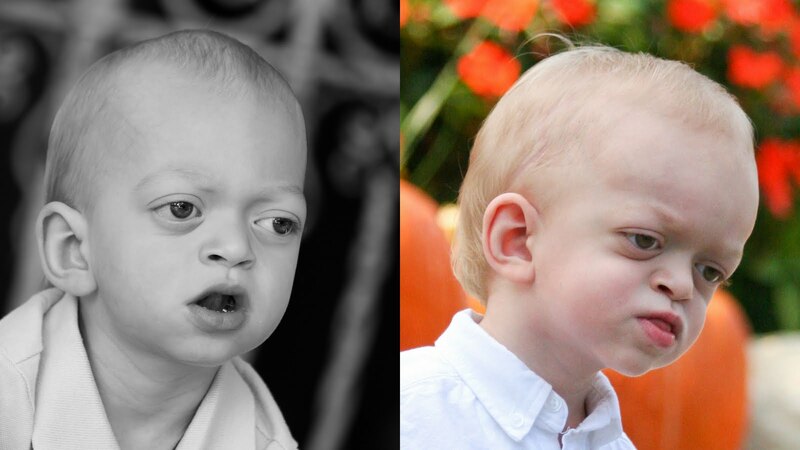 We have future surgeries to face, surgeries that will more significantly impact change on John's appearance. I have no idea how that will feel. I wonder how his feelings about the changes will influence mine. I hope those of you have been there will have some insight to share with me and our readers. I also want to thank Dede and Tricia for the research topics. I hope to have a post up in the next few weeks! Keep them questions coming! Feel free to email me directly at thetatertot.mom@gmail.com.